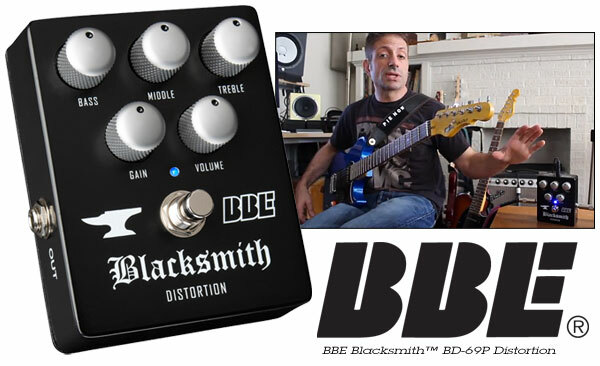 Nick Jaffe has just posted a great video demonstration of the BBE Blacksmith™ distortion stompbox. The Blacksmith is based on pedals hand-made by Paul Gagon for the gods of rock in the 1980s. Like those rare originals, Blacksmith features an LED-based distortion circuit paired with Paul's PLEX-EQ tone stack. Nick does a great job of explaining what this stompbox does and demonstrating how versatile it really is. And of course, he let's you hear several examples of the Blacksmith in action, courtesy of his gorgeous G&L Fallout™. About The BBE Blacksmith™: The Blacksmith™ analog distortion is all about force feeding your tube amp for a heavier, chunkier distortion. The concept was developed by Paul Gagon in the 1980s when he worked at Jackson Guitars. Back then, Gagon created pickups, amps and electronics for Jackson instruments and routinely worked with an A-list of artists, from Jeff Beck to Steve Vai and many more. What he found was many of the artists loved the sound of their Marshalls but wanted more grind out of them. Their amps may have gone "to eleven," but these guys often told Gagon they wanted them to "go to fifteen or twenty." Paul already had created many boost and distortion circuits, but ultimately, what he wanted to make a pedal for artists that would go beyond what a boost pedal could do while maintaining that classic Marshall tonal balance -- but on steroids. The solution was brilliant: a distortion generation circuit feeding a 3-band passive EQ derived from a '69 Plexi (a Plexi "Tone Stack"). The EQ allows you dial it in to suit the characteristics of a particular tube amp, a practical feature because some Marshalls were dark while others were bright sounding. Of course, the EQ is also great for style: want a killer shred tone? Scoop those mids and crank the lows and highs. Blacksmith is inspired by those pedals Gagon hand-made back in the '80s, delivering all the tone he brought to the rock gods but with greater consistency and durability. Blacksmith features 1% metal-film resistors, big fat signal traces on a mil-spec circuit board, true hardwire bypass to eliminate any pickup loading when disengaged, and a 1meg Ohm input resistance to welcome your axe's signal with wide open arms -- just like the input on a killer Marshall. The Blacksmith isn't just for Marshalls, however. Gagon's design works beautifully with a variety of other quality tube amps, from Mesa to Fender. When you’re looking for a top shelf distortion pedal that’s as musical as your amp, get your hands on a Blacksmith.